Download When The Bough Breaks in Digital HD from the iTunes store. When The Bough Breaks images are © Screen Gems. All Rights Reserved. Hollywood is full of real life stories of the husband running off with the nanny, or having an affair, and there have been several movies made similarly. In fact, there have been movies made where the nanny becomes obsessed with the husband and it didn't end well for the nanny. 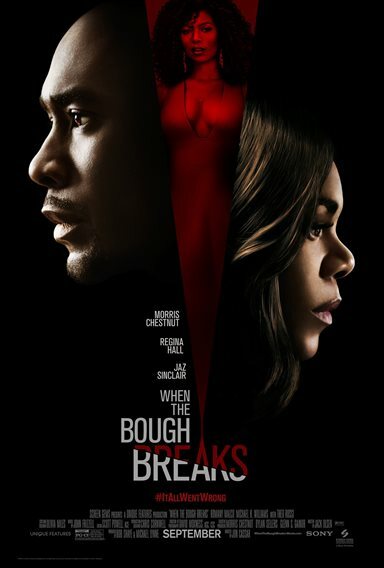 Screen Gems and Sony decided to put a little spin on a classic tale and update it for modern times - When the Bough Breaks is a story in which the surrogate becomes obsessed with the father to be. John (Morris Chestnut; The Best Man Holiday) and Laura Taylor (Regina Hall; Black-Ish) are affluent professionals who have tried for a long time to have a baby. After three (3) miscarriages, the Taylor's decide that they will hire a surrogate and chose a young woman, Anna Walsh (Jaz Sinclair; Paper Towns), who has eyes that they believe are innocent and is pure in her feelings to help another couple have a child. Lo and behold, the ultimate bait and switch – Anna falls for John and uses the unborn child as leverage. Director Jon Cassar (Redemption) didn't seem to have much to work with. The actors were wonderful but the script was mediocre. The writers introduced a psycho boyfriend for Anna who seemed to be the catalyst in making her think she could have John and more money, but soon it was revealed that Anna is simply insane and obsessed. The story has been done time and time again and the ending is predictable from the opening scene, in which the psycho lady dies and the baby is returned to his rightful parents. The only catch in this movie is the parents killed the surrogate – almost in self-defense – and the movie ends with the police coming up the path. The Blu-ray is presented in 1080p High Definition with an aspect ratio of 2.39:1. The darker screen shots did provide appropriate foreshadowing. The colors were clear and the actual cinematography was interesting in the fight scene. Sony used English 5.1 DTS-HD MA for audio. The background music was exactly right- it did not overpower the dialogue and complemented the film perfectly. Commentary with Director Jon Cassar, Writer Jack Olsen, & Actress Jaz Sinclair: Watch the movie with commentary and get an insider point of view of what is happening and why! The Have and the Have Nots: Interestingly enough, this section actually discusses the legal rights of the surrogate mother as compared to the biological parents; the economical differences between The Taylor's and the surrogate and differences in the movie that contrasts with how someone else may act in the circumstances presented. Deleted Scenes: Nine deleted scenes not shown on the big screen are presented for your perusal. When the Bough Breaks is a decent enough movie but the story has been done time and time again. There is really nothing special about the storyline or the characters. The characters have no depth; nothing to make you care about the outcome. Nonetheless, Regina Hall and Jaz Sinclair are wonderful actresses and I think that we will see Sinclair cast in more upcoming films.